Three ravens came down from the ramada today. One takes to drinking water from the bird bowl. The others pick and pull at cardboard, straw, bread scraps in the yard. They peck at loose material with their beaks, feeling their way through the world, learning about different materials. We learn through play and exploration. We take flight, not because it’s time to feed ourselves and wing flapping will help us do so. Sometimes we fly out of fear like Poe did yesterday. But mostly we take flight just because it’s fun. We learn through play. We also learn from our peers. One raven left up top, calls out yet to the others, afraid to make the leap. Their presence down below goads him. I can’t help but think that they’re also observing the other birds and picking up something of how to fly. Self-feeding is learned behavior. I wonder too about flying. In the absence of true parents, how quickly will they learn what to do? They will be left to learn only through play. Feral, without society and species context, what new world will they discover and invent? 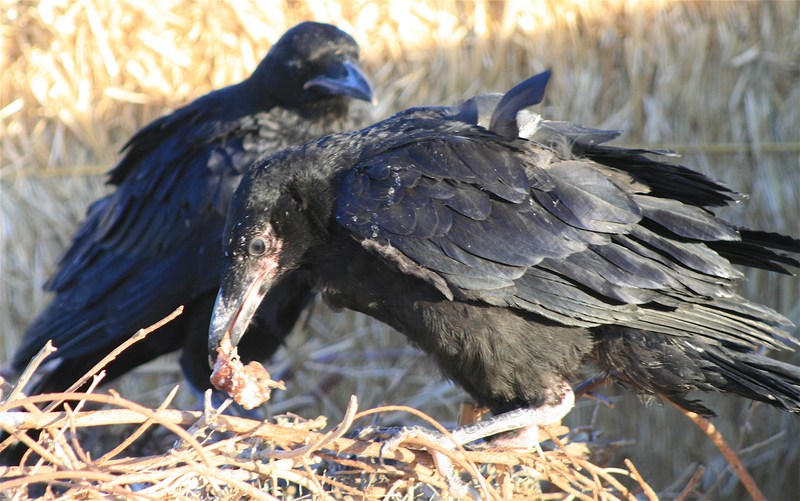 This entry was posted in Beings, Ravens and tagged feeding, Flight, Hopi, learning, peers, Ravens by Andrew Lewis. Bookmark the permalink. I cant believe you are not more popular because you definitely have the gift.thanks for your post..